All your love, all your caring ways, all your giving these years are the reasons why my heart thinks of you on Mothers Day with a wish for happiness and a world full of love. I might have never ever said thank you for all that you did for me. You brought me into this world, taught me how to walk, protected me from harm, motivated me to take decisions on my own, supported me whenever I stumbled and most importantly picked me up whenever I fell. So I am taking this day as an opportunity to thank you. Thank you so much Mom! Happy Mothers day! Nothing can be compared to the love a mother has for her children. Your love is incomparable, unconditional and inseparable. No matter where I go or what I do, at the end of the day I always find myself finding solace in your advice. I love you too Mommy. Happy Mothers day. Mother is an undying love, A love beyond compare, the one you take your troubles to, she is the one who really cares. Mother you are all of this and more, I love you very much! Mom Youve given me so much, Love from your heart and the warmth of your touch. The gift of life and youre a friend to me. We have a very Special Bond, which only comes from GodIm sure you agree. As a child I would say Mommy I Love You. Love you as my mother. I respect you as a woman. I trust you as my friend. You mean so much to me and Im so lucky to have you. Happy Mothers Day. My mom is a never-ending song in my heart of comfort, happiness, and being. I may sometimes forget the words but I always remember the tune. Mommy, I love you, for all that you do. Ill kiss you & hug you, because you love me, too. You feed me & need me, to teach you to play, So smile because I love you, On this Mothers Day. My Mother, my friend so dear, Throughout my life youre always near, A tender smile to guide my way, Youre the sunshine to light my day. Mother's Day greetings are used to express your love and affection for your mother on the occasion of Mother's Day. Mother's Day greetings are a way of portraying your love, warmth and affection for your mother. Mothers have the biggest and the most profound influence on the life of her children. The way she balances between her work and her responsibilities towards her family, she is no less than a super human-being. You can go online and choose from a variety of greeting cards that are available. Greetings cards have heart-warming messages written inside them for your mother. Mother's Day Greetings are a unique way of expressing your care and concern for your mother and wonderful options are available online for you to please your mother on Mother's Day. 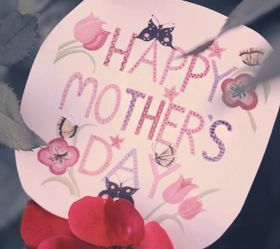 You can search for Mother's Day greeting messages and even create a homemade greeting card for your mother. You should definitely wish your mother with a greeting card on Mother's Day.